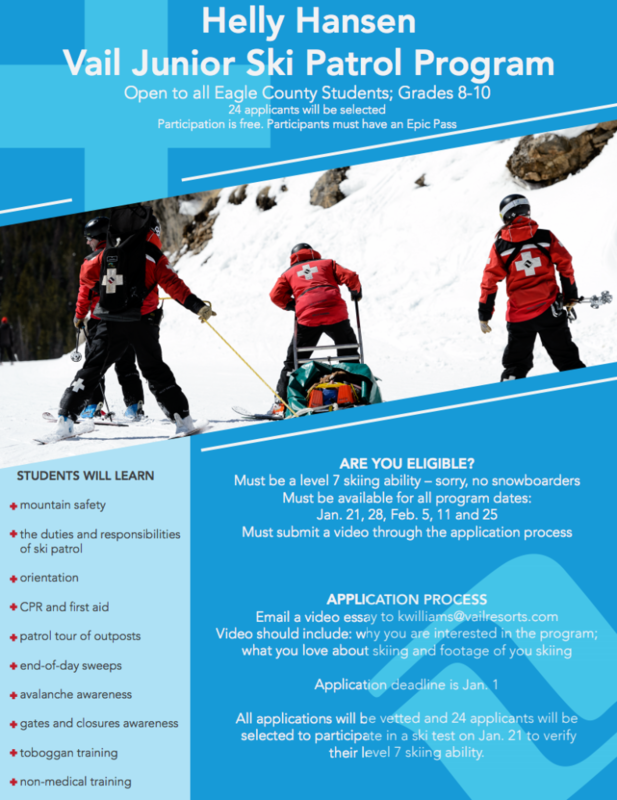 Vail Mountain has launched it’s first ever Junior Ski Patrol program, open to Eagle County students from grades 8-10. Both my mother and father served on the Vail Mountain Ski Patrol – in fact, my mom still does. When I was growing up here in the Vail Valley, I looked up to all of Patrol as my heroes. I am so proud that I have been able to make patrolling my career – and especially at the mountain where I learned to ski. And I’m so excited that Vail Mountain is launching this year, the Helly Hansen Vail Junior Ski Patrol Program. It’s open to all Eagle County students, grades 8-10, to apply. Just 24 applicants will be selected to spend four Sundays with us learning mountain safety; the duties and responsibilities of ski patrol; CPR and first aid; patrol tour of outposts; end-of-day sweeps; avalanche awareness; gates and closures awareness; toboggan training; and non-medical training. This program is free – all you need is your Epic Pass. You must be a Level 7 skier (sorry, no snowboarders.) The application process requires a short video essay to show us your skiing ability and tell us a bit why you’d like to be in the program. Email the video and any questions to kwilliams@vailresorts.com by Jan. 1. Program dates are Jan. 21 (for ski testing); Jan. 28, Feb. 5, 11 and 25. We are so excited to share our ski patrol world with you- it is all about passion for our mountain, skiing and sharing this awesome experience with everyone who skis Vail Mountain. There is a certain responsibility to make sure that everyone knows the rules of the road so we can all have fun safely. This is so cool, I wish this program had been available to me when I was growing up here! We cannot wait to have you on the team!